Affordable Funeral Cover | Funeral Cover ME - Get Covered! Affordable funeral cover can easily be explained. When working out your funeral cover premium for affordability it’s a good idea to break it up. If you take your premium amount, let’s say R30 p/m. You can divide that by the amount of days in the month. Take R30 and divide it by 30 (days). This will give you a mere R1 per day. This is just to show you how affordable funeral cover actually is. Let’s break it down even further. Nowadays, if you buy a loaf of bread and 2 litre milk, it will almost cost as much as your monthly premium. With this said, funerals today are way more expensive than you might think. Considering everything that need to be paid, funerals can easily run past R20 000. By getting affordable funeral cover, you can ensure that cash will be available during a time of need. With funeral insurance, you can expect to receive your pay out from 6 – 48 hours. Depending on the provider you choose. Most funeral cover providers in South-Africa do their best to settle claims as quickly as possible. They definitely understand the need to have money available fast. Most South African funeral cover providers can settle claims under 48 hours if all the documents required were received. If you take into consideration the affordability of funeral cover, it’s worth the peace of mind. If you can confidently rest assured that your family or you will be taken care of, it’s a small price to pay. 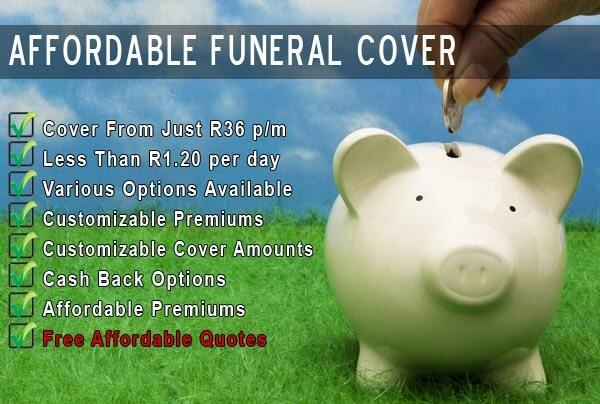 At Funeral Cover ME, we represent some the most affordable funeral cover providers in South Africa’s. We can amend your premium and cover amounts to suit your exact needs. The last thing we want is to arrange cover that is too expensive. What are you waiting for, the worst that can happen is you can get affordable funeral cover quotes for free. All we expect from you is that you complete the short contact form on the right. This way we can address you properly when we contact you. You can get affordable funeral cover today.